Do you have a paper postcode map for Australia? This is a commonly asked question. It is actually a challenge to do this on a single paper map because most postcodes are concentrated in larger cities – its where most of us live – but those places take up a very small proportion of the whole country. Even on a big poster it means the labels for city postcodes must be tiny and therefore hard to read. To get around this we use “insets” which show cities and other populated places at larger scales in map windows around the main map. You can see examples for individual states on the PDF map series page. If you simply must have postcodes for the whole continent on one map, we do have a range available. 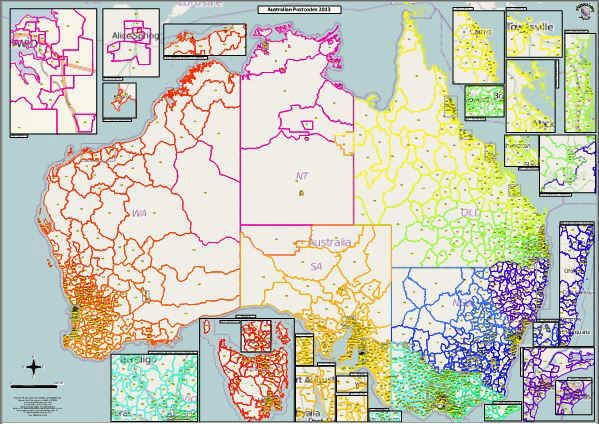 These are full colour poster size maps (A0 or B0), each of the two pages measuring either 1189 x 841 mm (A0) or 1000 x 1414 mm (B0), making extensive use of inset maps to address the complex issue of metropolitan detail for the Australian continent on single pages. There are illustrations and a summary of the practical differences between page sizes below. Using a double page layout gives you the user options of either wall mounting page above page, or sticking / laminating front to reverse. Laminating is not included and if required must be arranged separately after receipt of the paper products; most high street printers and / or office supply companies offer laminating services. Postcode labels are rendered as graphics (rather than fonts) allowing more flexibility for scaling – smaller postcode areas typically are rendered with smaller “font sizes”. This means in practice that some labels appear very small indeed – it is likely that even with good vision you will need to use a magnifying aid to read some labels. This is an inevitable compromise for a printed document of this type, as users of printed atlases will already be familiar! Top (or front) page. Actual sizes 1189 mm x 841 mm (A0) or 1000 x 1414 mm (B0). Bottom (or reverse) page. Actual sizes 1189 mm x 841 mm (A0) or 1000 x 1414 mm (B0). Screenshot of A0 map (front / top page) actual size. Please note screenshot is 96 dpi, paper maps are printed at store default, currently 300 dpi. Screenshot of B0 map (front / top page) actual size. A B0 page is 40% larger in area than an A0 page; a printed object occupying a 10 x 10 cm area on an A0 page is rendered as a 12 x 12 cm area on a B0 page. Please note screenshot is 96 dpi, paper maps are printed at store default, currently 300 dpi. 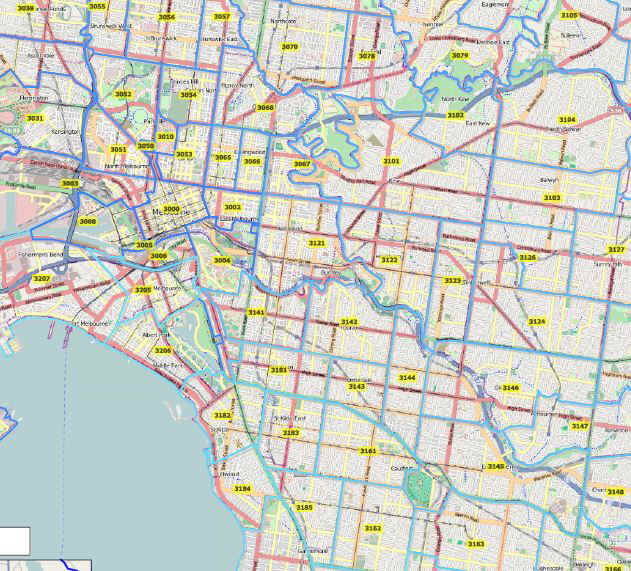 Screenshot of A0 map (Melbourne Inset / bottom page) actual size. Please note screenshot is 96 dpi, paper maps are printed at store default, currently 300 dpi. 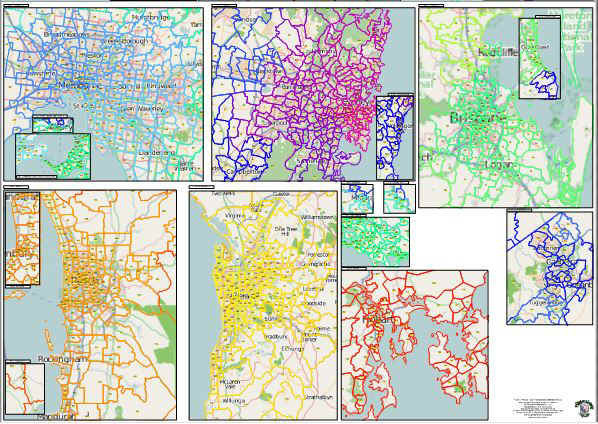 Screenshot of B0 map (Melbourne Inset / bottom page) actual size. Please note screenshot is 96 dpi, paper maps are printed at store default, currently 300 dpi. This product is printed on-demand using your choice of 160 gsm heavy coated bond, 200 gsm gloss or satin finish papers. The postcode area data is updated regularly, guaranteeing you receive an accurate up-to-date Australian postcode map. Prices vary according to your choice of paper size and finish. Prices are: $350 for the A0 size map on 160 gsm heavy coated bond paper; $410 for A0 on photo quality satin or gloss or for B0 on heavy coated bond; $550 for the B0 versions printed on photo quality satin or gloss paper. We typically supply these products via the Officeworks Colour Posters service, allowing you to collect from your nearest Officeworks store or arrange economical delivery. Please contact sales for your copy, specifying page size, paper quality, and Officeworks store location choices and we will remit via e-mail.